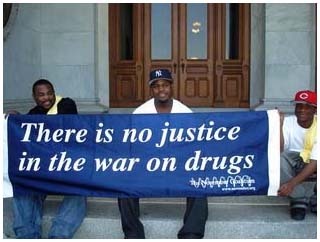 These New Haveners (Dramese Fair, T.J. Tucker and Patrick Falconer, left to right, holding the banner) came to the State Capitol Wednesday to ask a question: What if so-called "drug-free zones" protected kids near schools rather than brand entire cities? Their question was part of "Racial Justice Day." About 50 people from groups that included New Haven-based groups like People Against Injustice, Youth Rights Media and Fight the Hike rallied on the shady side of the Capitol and spoke animatedly with each other as they waited almost an hour for the event to begin, as organizers tried to round up supportive legislators to address the crowd. The lawmakers were having a busy day inside. 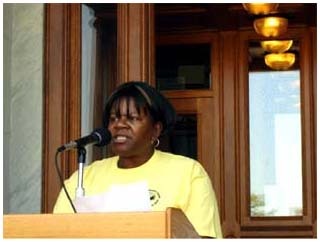 Co-Emcee Barbara Fair of New Haven (pictured below) laid out the reason for the gathering -- to discuss legislation proposed by grassroots groups around the state and hold legislators accountable to their constituents in the community. 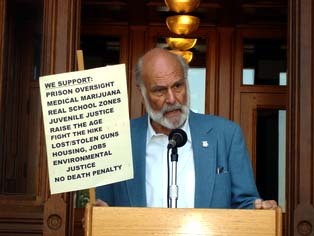 Issues included all those on the sign held by New Havener and former Connecticut House Speaker Irv Stolberg (pictured below), who was there on behalf of the Connecticut Network to Abolish the Death Penalty. The connection with racial justice is that, according to a handout from the group, "Statistical reviews in Connecticut have found significant evidence that killers of white victims are more likely to be sentenced to death than killers of African American victims. 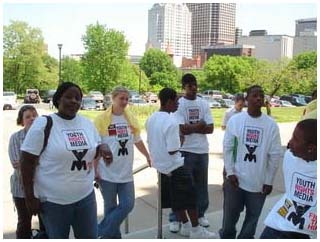 African Americans are the victims in 44% of all Connecticut homicides, yet as of October 2006, 86% of the people on Connecticut's death row [of eight people] are there for killing white victims." Sally Joughin, from People Against Injustice, said her top priority is creation of a Commission on Prison Oversight to make the Department of Correction accountable for treatment of its 19,000 predominantly black and Latino inmates. The bill her group submitted required participation by various stakeholders, but in the Judiciary Committee it was transformed to create an advisory group appointed solely by the Commissioner of Corrections, with none of those groups of participants mandated to be included. Joughin said, "The commissioner can ask advice of anyone she wants to -- she doesn't need an legislation creating an advisory group for that." The Alliance CT was promoting drug-free school zone reform that would reduce the zone (within which extra criminal penalties apply) from 1,500 to 200 feet around schools and enforce the restriction only during school hours. The group also supports removing day care centers and public housing from coverage under the drug-free zone, because the law as currently constituted makes a drug-free zone of entire urban areas. The proposal would shift resources from simple enforcement to treatment and education. "Reforming school zone laws is about making these laws actually protect children instead of over-incarcerating urban residents," said a press release handed out at the event, adding that currently 50 percent of Connecticut's total male prison population comes from Hartford, Bridgeport and New Haven. State Rep. Chris Caruso of Bridgeport was one of a few lawmakers who came out to praise the crowd for being pro-active and fighting for what they believed in. State Rep. Marie Kirkley-Bey of Hartford highlighted the efforts to reform the drug-free zones and to raise the age at which juveniles are treated like adults in the criminal justice system from 16 to 18. She also thanked people for coming out, but said, "You're too late." Since the session is winding down and ends June 6 (although a special session will be called after that), she urged them to keep organizing and come back early in the legislative process next year. After the rally, people went inside the Legislative Office Building to lobby their elected officials.